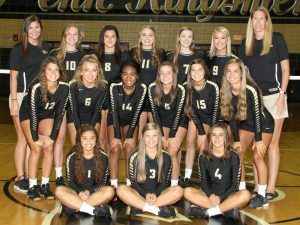 Penn’s Volleyball team Traveled to South Bend to battle Northern Indiana Conference foe South Bend Adams as the Kingsmen aimed to keep their NIC record perfect. The Kingsmen once again dominated a conference opponent with another three-game sweep. Penn swept Adams, 25-18, 25-14, 25-11. Alyssa Torres slammed 12 kills in the Kingsmen win. Molly Pooler and Rachel Rupert each had 6 kills. Naomi Williams ignited the Kingsmen with 33 assists. Rachel Hickey lead Penn with 14 digs. The Kingsmen move to 25-4 on the year, 8-0 in NIC play. The Kingsmen travel to New Prairie to face the Cougars on Wednesday.